On a beautiful hot day in the summer of 1941, at a bend in the road that leads out of the village of Panemunėlis towards Kavoliškės, a group of men, known to local people as baltaraiščiai or “the white armbanders,” Lithuanians who collaborated with the occupying Nazi forces, arrived on bicycles. They left the bicycles in the forest across the road from an isolated farmstead that belonged to the farmer, Petras Šarkauskas. They began to dig ditches in the forest. They did not have much success because tree roots prevented them from digging very deep. So they gave it up and took their shovels to the other side of the road and began digging in the boggy land that belonged to the Kavoliškis manor. An eight-year old girl hid behind a haystack and watched them. She was the daughter of the farmer, Petras Šarkauskas. After the hired laborer, Bronius, ran to find the farmer to tell him what was happening, the farmer came into the yard and both watched as a wagonload of people was carted over the uneven road—men and women and children. The captives’ heads were bowed and they had been blindfolded. Armed guards sat at the front and back of the wagon, holding the people at gunpoint. Many more armed men on bicycles rode alongside. In that wagon sat the Jaffe and Olkin families—two Jewish families who lived and operated small businesses near the train station in the village of Panemunėlis. Noah Olkin  was the local pharmacist. He was well known to the community for his kindness, often administering medicine to the sick free of charge. He was an intellectual who read Pushkin, Lermontov, and Dostoyevski. He was a member of the village elite and a close friend of the parish priest, Juozapas Matelionis. On Sunday afternoons after mass, Father Matelionis and Noah Olkin would drink tea together in the rectory. The wagon stopped just beyond a bend in the road. The families were ordered to climb out. At gun-point they were led to the crest of a hill. There they were ordered to undress. The farmer, his little girl, and the hired hand, soon could no longer see what was happening, but they could hear it. The screams and cries continued for a long time before the final gunshots came. Lithuania had remained at peace when German and Russian armies over-ran neighboring Poland in September 1939. In June 1940, the Soviets occupied Lithuania and soon after began to transform the country into a Soviet state. In the summer of 1941, within weeks after the Soviets engaged in mass deportations of Lithuanian intellectuals, military officers, educators, and more prosperous farmers and merchants to Siberia, the Nazis occupied Lithuania and took control of its government. By July of 1941 the Nazis had made it to Panemunėlis. The Olkin and Jaffe families had been arrested and held in a stable near the Panemunėlis church. The other Jewish families of Panemunėlis were held at the local train station. The Olkins and Jaffes were separated from the others because it was believed that they were more prosperous and might have more valuables with them. The Jews of Panemunėlis were shot together with the Jews from the Rokiškis ghetto on August 15 – 16. In that wagon also sat the Olkins’ nineteen-year-old daughter Matilda, who had been away in Vilnius (Vilna) studying Russian and French literature, but had come home for the summer holidays. Matilda was well known in the region as a gifted poet – her compositions had been published in Lithuanian literary journals since she was thirteen. In her slender notebook of handwritten poems, which was found almost half a century later, there is a poem that foretold this awful day. With a pain that could not be extinguished or laid to rest. And they—they just keep walking past and away. But for me, Lord, there are no words. Do you hear? Do hear that awful laughter? And the stone will cry, the stone will cry. But for me, Lord, there are no words for my horror. With an undying, relentless pain. Matilda’s peers remember that she liked to be alone. And that she would react with great sensitivity to even the smallest things. She finished the Panemunėlis Elementary School with honors. She attended Middle School and High School at the Kupiškis Gymnasium and the Rokiškis J. Tomo-Vaižgantas Gymnasium. She spent two years in Rokiškis, 1933 – 1935. After Lithuania regained its independence, a historian named Violeta Aleknienė gathered oral histories of the killings of the Jewish families of Panemunėlis. Violeta grew up hearing stories of the Olkin and Jaffe families’s murders. That day no one dared approach the killing site. The next day Šarkauskas and Vaitkevičius went over to take a look. They bodies were covered with a mound of dirt. Šarkauskas pushed in his rake handle and found the bodies were covered with only a few centimeters of earth. The farmers covered the bodies with more dirt and branches, forming a burial mound, so that wild animals could not get to them. A year earlier, in March, 1940, the then eighteen-year-old Matilda jotted down this poem in her diary. Longing crouches beside your cradle. And the road leads far into the distance. Will carry you silently through long generations. And as endless as the night. What crime had the Olkin and Jaffe families committed to meet such an end? They were Jewish. That was all. Neither Noah Olkin nor Mauša  Jaffe had been political. Neither had ever committed a crime. Neither had joined the Communist Party. Growing up as a Lithuanian-American, for many years I believed that the Lithuanians who murdered their Jewish neighbors were used by the Nazis, perhaps even forced at gunpoint to commit these crimes. Perhaps I comforted myself with this thought because the truth was too horrific to face. But Matilda’s story has forced me to face this truth—that her murderers were complicit, and they committed murder in full knowledge of what they were doing. Perhaps they killed because they were jealous of their neighbors? They hated the Jews because they perceived that they had a little more than they did—a little more wealth, a little more education. Finally, they killed because they had been indoctrinated by the hateful ideologies of their times. Violeta Aleknienė explained that the white armbanders who murdered the Olkins and Jaffes were brought in from other villages and did not know the local people of Panemunėlis. The Germans took over governance of towns and cities all over Lithuania and worked with local collaborators, who believed the Nazi propaganda that Lithuania’s Jews were responsible for the Soviet deportations of 1941. They did most of the shooting. In order for this system to work, it was necessary that collaborators would be brought in from other regions so that they would not have local ties with the people they were ordered to kill. Violeta Aleknienė cited eyewitness accounts stating that killers were given 50 to 200 grams of vodka before they conducted executions. Four of the killers were later identified, but only one was arrested by the Soviets. When the Nazis retreated, two of the others escaped to Germany and one escaped to America. Lithuanian historian Onutė Mackevičienė said that in her opinion these people killed because it gave them power over others. Violeta learned that attempts were made to save Matilda, and to save her father, and family. Once the Olkins and the other Jews of Panemunėlis were arrested, friends and neighbors did come forward to help by bringing them food and by trying to rescue them by hiding them. They did this at the risk of their own death and execution. However, these people were powerless in the face of the war machine of the Nazis and their local collaborators, who were helping the Nazis control the local populations. Ultimately, the Olkins made a moral choice. They knew that those who helped them risked death and the Olkins refused to put other people in danger to save their own lives. In this moral equation they chose their own deaths over the deaths of others. Matilda was a poet and her community saw her as special. She lived, after all, at a time and in a society where people appreciated the art of poetry and respected the expression of a higher truth through poetry. And yet, she turned down every single rescuer. Facing her own death, she would not part with her father and mother and sisters. Matilda sacrificed herself for love of her family. Poetry had taught her that this love was greater than her own self-preservation. She died in the most humiliating of circumstances, and yet she died together with her family, in full knowledge that love and beauty transcends all. Genovaitė Šukytė Grigienė was twelve years old when the Olkins were arrested. She was friends with Grunia Olkin, Matilda’s younger sister. I spoke with Genovaitė at her home in Vilnius. She recalled those days when the Olkins and Jaffes were held in the stable. According to Genovaitė, a few days before they were killed, Matilda was sent by the white armbanders to wash the floor in the train station. Matilda’s classmate, Juozas Vaičionis, who was studying to become a priest, recalls how he tried to rescue Matilda. Vaičionis snuck in and found her alone. What was revealed to me by the research of historian Violeta Aleknienė, including the oral histories she collected, and the research of Holocaust survivor and literary and theater critic Dr. Irena Veisaitė and others, is that in the decades before the Second World War the Olkin family, like many Jews of Panemunėlis, respected the Catholic faith of their friends, neighbors, and community. Similarly, their friends, neighbors, and community respected their Jewish faith. What also comes through is that there was warmth and sincerity in those relationships. 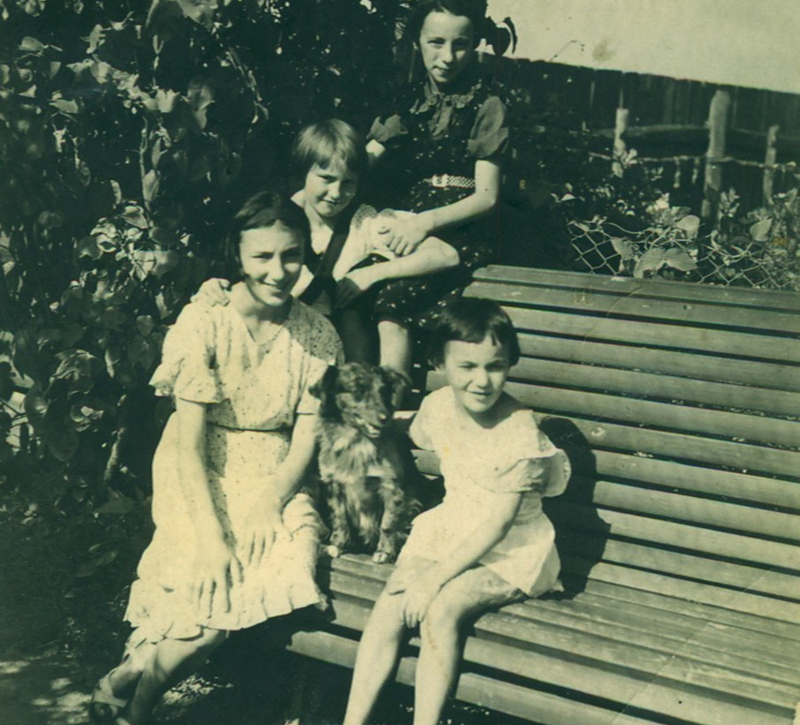 After the war two orphan girls met at the Salomėja Neris Gymnasium, Irena Veisaitė and Genovaitė Šukytė. They became friends and are close to this day, over seventy years later. They both survived. Matilda died. But Matilda connects them still. Irena Veisaitė is a Holocaust survivor, literary critic, theater critic, and Professor of Literature for half a century. At the age of 13, Irena escaped the Kaunas (Kovno) ghetto with the help of Catholic friends, who hid her until the end of the Nazi occupation. She lived with the family of Lithuanian Army Officer Kazys Ladiga, who was murdered by the Soviets in 1940. She lived with the family until they were deported by the Soviets to Siberia after the war. Irena has dedicated her life to teaching a lesson of peace, forgiveness, and reconciliation to Lithuanians and Jews. “All rescuers are saints,” Irena said. “They risk everything to save a stranger.”  She attributes her life philosophy to the kindness of the people who saved her and helped shape her into the person she is today. No one quite knows the circumstances, but before the Olkin family was killed Noah Olkin managed to pass his daughter’s diary and notebook of poems to Father Matelionis. The priest hid the diary in a secret compartment inside the church’s Great Altar. Three years later, the Soviets drove the Germans out of Lithuania and in 1950 Father Matelionis was deported to Siberia as part of a mass deportation of the clergy and Lithuanians who had rescued Jews from the Nazis. The diary and the notebook of poems remained hidden and unknown for many years. During the Soviet occupation, in the eighties, Alfredas Andrijauskas, organist at the Panemunėlis church, recovered the notebook of poems and brought them for safe keeping to Irena Veisaitė, who immediately recognized the literary value of the poems. The diary was brought to her a few years later by Soviet General Matulionis, who was from Panemunėlis. Irena kept the diary and poems safe over thirty years. This past summer, her health ailing, she donated them to the Institute for Lithuanian Literature and Folk Culture. In October 2017, I spent a few hours in Irena’s apartment reading Matilda’s diary and the notebook of her poems. They were too precious to leave their custodian’s vigilant eyes. I took photos of the poems with my phone and at home typed my translations onto my laptop while referring to photos of the handwritten diary on my phone. The poems had spoken deeply to my soul. I am a poet. I could only think that if I had died so young, just as I was beginning to find my voice as a poet, I would have wanted someone to find my notebook. I would like for my translations to breathe life back into the poems written out in a fountain pen on the now-brittle, yellowed pages of an old school notebook. When we parted that day, Irena looked into my eyes and said, “Sielos susišaukė” (“Our souls have spoken to each other”). We both knew that it was right that these poems appear in English, so that the rest of the world could share Matilda’s words. I’m thinking now about what a person’s natural state of being is: whether it is to live a simple gray every day life, where we approach things with a light and open touch, or whether it is to live in an enlightened state of being, when between us and phenomenon a deeper feeling arises that raises the level of our thoughts, which gives everything meaning, putting it all on a higher plane. Is a person’s nature gray and mundane, only very rarely rising up into a higher spiritual plane? Or is it full of light—call it sacred—and only by force pushed down into the level of gray everyday existence? And where is the true me? Is it the me that gossips about others, chatters away, gets angry, and has little patience? Or is it the me that rises above and creates, that loves, that trembles in eternal bliss, when the evening spreads across the wide fields and the heavens overhead are wide open and endless, and when in this sacred silence you hear the word of God speaking to you. What is the natural state of a human being? Perhaps both of these are natural to us? Just like hate and love, like destruction and creativity, like keeping watch and sleeping. She asks herself: should she break up with Him or not? Does she really love Him? Does He love her? She writes about her family, their moments of warmth, their squabbles. But she also writes about how society was changing around her under the Soviet occupation. In the evenings Papa always says: “One more day has passed.” His comment is directed at me. One more day has passed and I haven’t accomplished anything. I must admit, I enjoy arguing with Papa. Our arguments are cultured and rarely escalate beyond the norms of civility. Papa is worried about my future. But I just grab hold of a few cliches to make my point. Papa is deeply hurt that I am not writing now. I just find some justification, which I don’t believe myself and nobody else does either. Part of the diary she wrote while still at home, and then the second part when she was a student at Vilnius University, where she took classes on Victor Hugo, semiotics, Latin Writers of antiquity and other esoteric subjects in the humanities. The day that I must leave is drawing closer. This year I will need to study very hard and put all my energy into my work. I am considering taking Slavic languages as an elective. But I will give it some more thought. Maybe. Whatever I end up choosing, I would like to work very seriously at my studies this year. I’d like to improve my grade in Lithuanian language. I will need to take a few exams. And then, and then—I want to publish my book. I want to take care of all the editing and all the details. If I see that we do not have that thing that is called, “Wahlverwandtshaft,” then I will sacrifice everything and step aside. Today I should not write in my diary. It has been a day without sadness and without joy. I read a book in three hours, I walked around in my bathrobe all day long, my throat hurt, the battery in my radio died. What I should do is sit down and work on editing several poems. Oh, that poetry collection of mine! I am working on it with no inspiration, knowing that no one will publish it anyway. There is nothing in my poems that is relevant. I write about the pain of suffering over centuries at a time when we are required to sing about how happy we are right now and about our bright tomorrow. At a time when one of Lithuania’s most beloved poets, Salomėja Neris, had crumbled under the weight of the first Soviet occupation and began writing odes to Stalin, Matilda was true to her poetic vision. Even knowing that it was unlikely that her collection of poems would be published because she refused to change her artistic vision to suit the politics of the times, she continued writing in her own voice, never compromising her artistic or moral integrity. Matilda’s diary reveals that she was well aware of political events in her country and had firm opinions. In a diary entry dated August 28, 1940, she criticizes the Lithuanian poets who debased themselves by writing social realist verses honoring dictator Joseph Stalin. Times are awful. The world has spilled out into the streets. People shove a red handkerchief into their pocket and shout. Salomėja Nėris, Liudas Giras—I cannot fathom how normal people can write that way. There are banners and more banners everywhere. The biggest communist, if there were such a one who is a cultured person, would not be able to stand it. I often think about how people lack culture. It is sad. Could it even be possible for communism and its ideology to be expressed in poems that are not dominated by destruction, but by creativity, not by hate, but by love? Matilda writes about how she disliked the Soviet regime because she felt they were common and because they tried to control artists. Yet her brother, Ilya, joined the Communist Youth, quite possibly out of idealism. Matilda wrote in her diary with irony: “We received a letter from Ilya. It was a patriotic letter about our Soviet homeland. Ilya is one of those enlightened people who believes in communism.” She recounts how she had to learn how to march in Soviet parades and help register Soviet military families to vote. Yesterday I spent the day writing down the names of families of the Red Army for the elections. All day long I suffered their stench and filthy smells. The women are ugly and have vulgar enormous chests. All the women, babies, grandmothers, when you ask them their nationality, answer the same—we are Slavs. When I returned to my room, where it was clean and bright, I was overwhelmed with the feeling that I would like to have a loving husband and a dear baby of my own. The wish to lead an ordinary life becomes a pervasive theme in Matilda’s diary. Yes—if only I had a baby to care for I would calm down. And not because I would beat down all my passion, but because I would have someone to give all my fire, all my love, all my life. I would like a healthy, beautiful baby, one with brown eyes, or blue eyes, like His… A healthy, beautiful baby. That would be my compensation for my difficult, heavy days, for all my days of longing, all my restless nights. At the same time, however, Matilda does not give in to the darkness she perceives around her. In a diary entry dated September 4, 1940, she reflects on how light can be found within darkness. I read a novel called Kotryna. I’ve noted the author’s name a few times, but I keep forgetting it. I like these types of books—written by Nordic writers. Those books emanate a healthy freezing cold and inner strength. I respect a book that contains innate optimism. You can see that in writers who have a healthy soul. Their book may depict the greatest suffering and pain, and yet the reader will feel some sort of light and warmth that comes from the writer’s inner soul and which reflects the writer’s belief in a person’s humanity. When a writer believes in humanity, and when within the writer a divine fire burns, even in the midst of the deepest suffering, the writer, perhaps without even realizing it, will lead the reader into the light, into an optimism that a subtle reader will sense. Fania has given birth to a son. Today we all wrote her a letter with our congratulations. We mailed her a package. I yearn to say that those things do not matter. What matters is the great joy that a mother feels. The opportunity to raise a person who will be a better person than she is. I don’t know why, but my future sometimes flashes before me in a way that is so sad and so painful that without even realizing it I crumple up in pain. I want to freeze. I feel helpless and lose the will to do any work or to think. I would like to return to Vilnius and resume my studies. That is the fate of restless souls like me: We wander from one place to another, hoping to find some peace. In the same diary entry, Matilda observes that her entire family feels the underlying tension that is in the air, beneath the routines of everyday life. I sometimes think, what does our home lack? How I suffer on those days when everyone walks around as though electrified and each one of us lets off sparks. But it passes easily. All we need to do is to lay a pretty white tablecloth down on the dinner table, set the table nicely, light the lamp—and then Papa, when he hears a Strauss waltz playing, begins conducting the music with his hands, and then invites one of us daughters to dance with him. I was insulted when Galia and Fima, whose real names are Gita and Chaim, began making fun of the Yiddish language. Lord! How low. How stupid. After that we all enthusiastically sang Yiddish songs together! The last entry in Matilda’s diary is in February, 1941. There are plenty of blank pages left, so it is not clear why Matilda stopped writing at this time. Eight months before her death, Matilda wrote a poem that describes her own funeral. Her handwriting appears as though she wrote the poem hastily, spontaneously, expressing the emotions that were weighing on her. Was this a premonition? Or was she frightened by the war that was drawing closer and closer to Lithuania? In my home of mourning. And armfuls of lilies, white. And faces wearing bright smiles. A black ribbon is tied in my hair. The whitest of the white blossoms. I see them, I speak to them. And not one will see love. Matilda’s notebook of poems is 96 pages long. It contains 34 of her original poems, dated between September 23, 1938, and October 9, 1940. The last entry in the notebook, dated May 12, 1940, contains her translation into Lithuanian of a poem by the Jewish poet Noah Gotlib. On the cover of the notebook, she wrote: “M. Olkinaitė, 1938. VI. 21.” Olkinaitė is the Lithuanian version of her surname. Matilda’s early poems reveal that she lived a happy childhood. A poem from July, 1938, written when Matilda was sixteen, captures that youthful exuberance and happiness. Matilda, like many Lithuanians of her times, was a child of nature. Therefore, nature, and her relationship with nature, play a strong role in her poetry. And is leaping from her bed. All the flowers and the birds. The girl sends the herd. And the Sun, and the birds. In the eyes of the little girl. Her eyes are bright, full of light. A world bursting to life and filled with sunshine. Matilda had to grow up quickly between the autumn of 1938 and the spring of 1940. While her early poems, like “Good Morning!” reflect her happy childhood and home life and love of nature, the later poems became more reflective, darker, and indeed prophetic. In an analysis of Matilda’s poems published by the journal of Lithuania’s State Jewish Museum, senior researcher Ilona Murauskaitė observed that the style of Matilda’s poems is reminiscent of the poetry of her contemporaries Salomėja Neris, Bernardas Braždžionis, and Jonas Aleksandriškis (Jonas Aistis). The influence of other poets is typical for any developing poet, Murauskaitė concedes. In the prewar era, the predominant topic of Lithuanian poetry was agrarian, a delight in the beauty of nature and of a simple life lived on the land. At that time most of the Lithuanian population lived in rural areas. Yet, the influence of prewar Lithuanian lyric poetry is dominant mainly in Matilda’s early poems. Then, at some point, she moves beyond her literary moment and finds her own voice, a voice that is both Lithuanian and Jewish. Matilda’s cultural identity was both Lithuanian and Jewish at the same time. This comes through in her poetry in a powerful way. As I translated her poems, I put together a small glossary of symbols that appear in her work. The Sun (Saulė), for example, refers not just to the physical sun in the sky, but also to the Lithuanian Sun Goddess, who in our folk tales rides across the sky in a golden chariot. The Sun Goddess is one of the most important deities in the Lithuanian pantheon of gods. She brings joy, rebirth, and happiness. The stone in Matilda’s poetry is a Jewish symbol. The stone is the source of her strength as a Jew, and also represents her faith. The Three Hills in Lithuanian folklore refers to a land far away and unreachable, a land that can be dreamt of, but never reached. If one goes to the land beyond the Three Hills, one is gone forever. Dark eyes (brown eyes) refer to a Jew. Blue eyes refer to a Lithuanian. By the fall of 1940, Lithuania had been incorporated into the Soviet Union, which was an ally of Nazi Germany. However, the incongruity of their alliance was apparent to all, and fears of the war reaching Lithuania grew. Matilda’s poems became more preoccupied with the impending doom that she sensed was coming to her country, and to the Jewish people. She longs to utter one single word that could bring all the world back to its senses. It is so hard for me. I would like so much to utter one word. That unspoken word trembles within me. I glance aside and I see processions, generations, gliding past. And a blue longing and shivering suffering. And the pain of aeons of shattered hopes. But I—am that unspoken word and shadow. I carry that unspoken word in my heart. It is so difficult for me. I would just like to utter that one word. Just one word for the crowds and for the nations. The processions would pause. Time would come to a halt. All the generations would pause, and listen. And my word would flutter above the mountains and the seas. Above flowing rivers and rough waters. Unable to utter that single word, she sensed that death is drawing close. In a poem written before the Soviet takeover, dated March 27, 1940, Matilda envisions Death as the Grim Reaper, who, according to Lithuanian folklore, takes on human form and comes to collect his due. And mine will sink as well. To the seagulls and the waves. And I sing to them too. And will pull me under. And my skiff will too. Matilda foretells the destruction that war will bring to Lithuanians, the blue-eyed. This poem, which depicts three sisters leaving for foreign lands, could be read as a premonition of Stalin’s mass deportations of both Lithuanians and Jews to Siberia, and also the escape of almost a third of Lithuania’s prewar population to the West at the end of the war. Was it true, or was it a story? And their eyes were blue. The Sun and all the flowers. In a poem dated October 19, 1938 Matilda describes a vision that the Sun, her symbol of hope, joy, and life, is carried off beyond the Three Hills by a black angel. Below the poem is a notation: “Written during the gnosiology lesson.” I could only imagine that Matilda quickly penned this poem during a lecture, moved by intuition, or perhaps by the content of the lecture? I did not know what gnosiology is, so I looked it up: Gnosiology (Gnoseology) is the study of knowledge. It is a term of 18th Century aesthetics, meaning “the philosophy of knowledge.” The term is used in regard to Eastern Christianity. The theme of going away, beyond the Three Hills and never to return, emerges in another one of her last poems. Here snowflakes are alluded to as stars, which also may be read as Stars of David. Poetry speaks to us at our deepest level of humanity. Poetry speaks to our souls. To experience a poem, to live through a poem, one must access the poem through emotion. One of the reasons, I believe, that many people in our times no longer connect with poetry is because in schools young people are taught to analyze a poem, not to experience a poem. A poem must be pried open and its “meaning” or “message” must be discovered and reported dutifully in a test. In this process the emotional power of a poem is stifled, replaced by impersonal rationality. It is no wonder that so many people struggle to understand why earlier generations became so attached to poetry. To understand Matilda, to experience the full depth of her soul, it is vital to access her poems through emotion. Matilda was barely nineteen-years-old when she was murdered. She’d only just begun to find her voice as a poet. And yet, being so young, she absorbed the horror of her times. She perceived the impending tragedy of the Holocaust and also sensed the fundamental tragedy of humanity that repeats itself age after age. But at the same time she reveled in the fragile beauty of provincial life. It was thus a time of shadow but also a time of light. It was a time of shattering contrasts—good and evil playing out on the world stage. Matilda was ultimately a victim of evil, but she remains a survivor of good. She never gave in to evil, up to her very last moments on earth. She remained with her family and she retained her dignity. Matilda had the vision to perceive that even in humanity’s darkest hour, love, beauty, goodness, and simple kindness can continue in the world. Matilda symbolizes all that Lithuania lost forever with the annihilation of the nation’s Jews and with the Soviet occupation and deportations. For many long decades her life was not spoken of – but neither was it entirely forgotten. Since independence Lithuanians are beginning to rediscover this and other parts of their nation’s past that were not openly discussed in the repressive periods of the Nazi and then Soviet regimes. I spent an afternoon with 96-year-old Liucija Neniškytė-Vizgirdienė in her cozy bedroom in her son’s house in the Vilnius neighborhood of Žverynas. Liucija’s grandparents lived across the yard from the Olkins and operated a mill. Liucija became the best friend of Mika and Matilda and would spend summers with the family. She would also return for the Christmas and Easter holidays. All of the Olkin children would stand and wait on the platform to greet Liucija when she arrived by train. Liucija recalled that every day the neighborhood children would eat lunch at the Olkins and dinner at her grandparents’ house. Her grandparents would tease that the Olkins fed Liucija so well that she had no appetite left for dinner. Her grandmother would bring Asna Olkin cheese and butter. Every summer her grandmother would order a bolt of fabric and sew identical dresses for the three Olkin girls and Liucija. On Saturdays both the Jewish family and their Lithuanian friends and neighbors observed the Sabbath, which they shared together. At Sabbath dinner the children would read, put on plays, and entertain the guests. Always in attendance were Dr. Sadauskas, Father Matelionis, the teachers Jonas Siminonis and Stasė Valavičiūtė, the station master Prokapavičius, and others. Matilda and Mika, Liucija remembers, were creative, brilliant, expressive, vocal. Liucija said that Mr. Olkin would introduce games to teach his children creativity and critical thinking. She remembers how there were a few country roads surrounding their town that had not been named. Olkin sent the girls out to take note of the landscape surrounding those roads and to give them names. When Matilda started studying in the Gymnasium, she decided that they were too old to play children’s games. She suggested they start a newspaper. And they did. Every Sabbath the guests could read the handwritten newspaper for the price of twenty cents. The girls would take their earnings to the local shop to buy karvutės, a caramel candy. Liucija recalled that the last time she saw Matilda alive she went to visit her in the room she rented across the street from the synagogue on Pylimas Street in Vilnius. Matilda told Liucija that she had dedicated a poem to her and that she should look for it in a certain magazine. Liucija recited the poem to us from memory, which was not included in her notebook of poems because Matilda composed it later, possibly in 1941. Was white, filled with sunlight. And your shutters were white too. You dried mint on your windowsill. And kept them in water on your table. The wind blew out your candle? Paused a moment, then left? Quietly on your white shutters. It stopped your old clock. It snuffed our your white candle. But the world is so wide. Where will you go, my beloved? Liucija told us that Matilda showed her a pair of beautiful, expensive, Czech shoes. She smiled and said, “My love gave me these.” Liucija asked if Sheras gave her the shoes. “Oh no, my true love,” Matilda answered mysteriously. Liucija remembers Matilda was very happy that day. She was content with her life. That is how she likes to remember her. A few weeks later, the Nazis occupied Lithuania and Matilda’s young life of love and poetry was cut short. In 2016, playwright and director of the Rokiškis Theater, Neringa Danienė, learned about the diaries and the notebooks. She resolved to write a play that would show both the beauty and the tragedy of Matilda’s short life, and that would educate Lithuanians about the loss of Lithuania’s Jews and Jewish cultural heritage in Lithuania. The Silenced Muses is a documentary play narrated through Matilda’s poems, diaries, and the oral histories and research recorded by Violeta Aleknienė. The former director of the Rokiškis Theater, Rytis Saladžius, had good ties with the Jewish community and was one of Neringa’s advisors. “We discussed with the Jewish community what to include in the play. We did not want to be superficial,” Neringa said. The Silenced Muses premiered on November 18, 2016 at the community center in Panemunėlis. By bringing the story of Matilda and her family back to the Olkin’s home town Neringa blurred the boundaries between art and reality. What Neringa did with The Silenced Muses was more than a performance. The play was an important emotional landmark for Lithuanians. The play became a way of healing and remembering the people they had lost. Through the play the people of the Rokiškis region were forging a link back to the past, before the terror of World War II, when Jews and Lithuanians lived in one community together. On a cold rainy October day in 2017 I saw The Silenced Muses performed in Rokiškis. I laughed, I cried, I mourned together with the audience. I asked Neringa what she’d wanted to find out when she wrote the play. “Did you find an answer?” I asked. When I visited Panemunėlis in October 2017, Violeta Aleknienė brought my friend Saulė and me to see the totem. We had not had breakfast. I spotted a small grocery across the street. I offered to run over and buy some rolls. Within a few minutes, a spitting image of Santa Claus opened up the door to his home and invited us inside. He and his wife have converted the old village schoolhouse into their home and studio. The part of the house that was the original rectory where Father Matelionis had hid Noah Olkin is now Vidmantas’s workshop, thus connecting history in a visceral way. Inside a masonry stove provided a warm glow of heat, relief from the damp and cold, and the never-ending Autumn rain. One entire wall was covered with Vidmantas’ handmade carved decorative spoons and the other was covered with certificates of appreciation for his work as a sculptor and as an educator. Vidmantas plucked one of the pretty spoons from the wall and presented it to me as a gift. We were unexpected guests, and yet his wife hurried back and forth from the kitchen, bearing platter after platter of salads, sweets, sausage, cheese, and ultimately hot pork chops straight from the oven. Our talk centered around Matilda and the sculpture that Vidmantas had carved with such loving care. Once Vidmantas had conceived of his idea for the sculpture, a design that would incorporate a book and Matilda’s beloved lilies, it took him four days to carve the totem. In 1998, seven years after Lithuania freed itself from the Soviet Union, a man from Panemunėlis named Pranas Paršonis wrote an open letter to the local newspaper, Rokiškio Pragiedruliai, demanding that the Olkin and Jaffe families’ murder site be appropriately marked and remembered. I reached out to Lithuanian historian Arvydas Anušauskas and asked him why all killing sites were not marked and how did the killers manage to continue to live in their communities, and whether any serious scholarship was done by Soviet-era historians on the Holocaust in Lithuanian. Nineteen years after Paršonis wrote his letter, local Lithuanians, inspired by Neringa’s play, decided they would wait no longer for the government to do something about the unmarked killing site. They organized for a memorial to be erected at the Olkin and Jaffe burial site. They wanted the memorial to appropriately reflect the Olkins and Jaffes’ Jewish faith. The solution was to erect a large stone with the names of the murdered families engraved in Lithuanian and in Hebrew. The memorial site was finally commemorated on September 8, 2017, with a large unveiling ceremony attended by crowds of local people and visitors from abroad. Matilda died a poet’s death. A poet is a visionary. Every society values and loves its poets. To murder a poet is to commit murder against humanity. The relentless cold autumn rain did not let up the entire time I was in Panemunėlis. We stood in the cold rain with the dark heavy Lithuanian sky overhead and gazed at the memorial, all that was left of the silenced muse’s short life. All that was left of two Jewish families who had lived, loved, and laughed in this land. May they rest in their eternal sleep. It was silent in the field. I remembered how precious silence was to Matilda. In one of her last diary entries, not long before her death, she described a silent moment spent with the young man with whom she was in love. I remember one moment. We sat together and we were silent. And then in a clear and quiet voice he said: “Patinka?” (“Do you like this?”) Oh, there is nothing more beautiful than a word spoken into silence. And in that one word there is both a question and a promise, and hope, and love, and a quiet fatherly blessing. Matilda’s short life and her poems stand as a testament that the fragile beauty of the written word gives us strength even in humanity’s darkest hour. Aleknienė, Violeta. “Apie tragišką vaistininko Naumano Olkino šeimos likimą” (“About the Tragic Fate of the Pharmacist Olkin’s Family”). Monografija (Lietuvos Valsčiai) Panemunėlis II. 2011. Pages 1493-1501. Paršonis, Pranas. “Tą Rytą Girdėjo Dainuojant” (“That Morning They Heard Them Singing”). Rokiškio Pragiedruliai. March 6, 1998. Pages 3/6. Veisaitė, Irena. “Keliai į Saulę” (“The Roads to the Sun”). Krantai. Page 88. The diaries and notebook of poems by Matilda Olkin (Matilda Olkinaitė), 1938-1940. Interviews with Rokiškis Theatre actors, October 7, 2017. Interview with Vidmantas Zakarka, Panemunėlis, Lithuania, October 8, 2017. Interview with Liucija Neniškytė Vizgirdienė, Vilnius, Lithuania, June 25, 2018. Interview with Irena Veisaitė, Vilnius, Lithuania, July 10, 2018. Interview with Irena Veisaitė, Vilnius, Lithuania, July 12, 2018. Interview with Genovaitė Šukytė Grigienė, Vilnius, Lithuania, July 12, 2018. Interview with Neringa Danienė, Rokiškis Museum, Lithuania, July 13, 2018. Interview with Violeta Aleknienė, Rokiškis Museum, July 13, 2018. Czarist-era records refer to him as No’ach Olkin and inter-war Lithuanian records give his Lithuanized name as Noachas Olkinas. In his community he was known as Naumanas. Violeta Aleknienė, “Apie tragišką vaistininko Naumano Olkino šeimos likimą” (“About the tragic fate of the family of the pharmacist Naumanas Olkinas”), Panemunėlis II dalis (Versme 2011, ISBN 978-9955-589-27-3), pp. 1493, 1500 (“Aleknienė”). Ms. Aleknienė is the director of the Kupiškis Ethnographic Museum. One inter-war Lithuanian record gives his name as Elija. This is a remote location about 10 kilometers north-northeast of Rokiškis. Juozas Vaičionis, Memoirs. Vilnius, 2008, p. 87. E. Rudokienė, Memoirs, Rokiškio krašto muziejus (Rokiškis Regional Museum, 2001, p. 91. 1. 16. Interview with Neringa Daniene, Tema, November, 2016. Born in 1901 in Kovno, Lithuania, Noah Gotlib is remembered as a talented poet, writer and journalist, an individual who spoke to many through his multitude of work. Gotlib, whose father was the head of a Hassidic yeshiva, was educated in both traditional Jewish and secular schools. Gotlib also studied for and received his teaching diploma from a Soviet Normal School. Gotlib’s earliest poetry was in Hebrew but he soon took to writing in Yiddish. This writing included lyric poetry and prose, essays, literary criticism and articles. Vėbriai, a small village near Panemunėlis. Ilona Murauskaitė, “Širdy nepasakyta žodį aš nešu” (“I Carry and Unspoken Word in My Heart”), Lithuanian State Jewish Museum. Pranas Paršonis, “Tą rytą girdėjo dainuojant” (“That Morning They Heard Them Singing”), Rokiškio Pragiedruliai, March 6, 1998, Page 3/6. Personal email, April 21, 2018. Interview with Violeta Aleknienė, Rokiškis Museum, Lithuania, July 13, 2018. Interview with Liucija Neniškytė Vizgirdienė, June 25, 2018. Interview with Dovid Katz. “Lietuvos Holokaustas buvo neįtikėtinai baisus” (Lithuania’s Holocaust was especially horrific). Lietuvos Žydų (Litvakų) Bendruomenė (Lithuania’s Jewish (Litvak) Community). December 12, 2010. Interview with historian Onutė Mackevičienė, Director of the Rokiškis Museum, Rokiškis, Lithuania, July 15, 2018. Interview with Dr. Irena Veisaitė, Vilnius, Lithuania, July 12, 2018. Švedas, Aurimas. Irena Veisaitė: Gyvenimas turėtų būti skaidrus (Irena Veisaitė: Life Should be Beautiful). Vilnius: Aukso Žuvis. 2016. Pages 54 – 55. Interview with Liucija Neniškytė-Vizgirdienė, June 25, 2018. At the time there was a movement to replace Yiddish with Hebrew among Lithuanian Jews. Copyright 2018 Laima Vince. All rights to the text and English translations of poems and diary entries reserved. All rights to this essay reserved. No part of this publication may be reproduced, distributed, or transmitted in any form or by any means, including photocopying, recording, or other electronic or mechanical methods, without the prior written permission of the publisher, except in the case of brief quotations embodied in critical reviews and certain other noncommercial uses permitted by copyright law. For permission requests, write to the author at laima.vince@gmail.com.